← Rattlesnake Season Begins: Update! 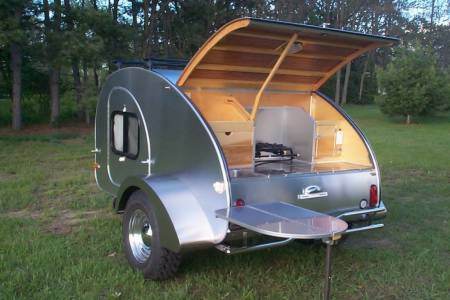 Two weekends ago, I saw a Teardrop trailer for the first time and it was true instant love. I love many things about Teardrops: a place to sleep, a place to cook, a place to write, but most of all, it’s a place to call home. I’ve spent the past seven years moving around the country every four to six months as a professional housesitter. Caretaking is an awesome side career for a travel writer and one I hope to continue, but as somebody who values personal space, never having my own is starting to wear on me. The idea of being able to customize a small space and have it be mine makes me downright giddy! I have about a month left at the Earthship, before the owners come back and then I’m hitting the road for the summer! As of now, my route is totally to be determined and I plan to keep it that way! The goal will be Alaska, but there’s a lot of ground to cover between here and there. I’m open to wherever the road may take me and the Teardrop will give me a place to sleep, work and call home along the way. I may live out of my car, but I’m no bum. I’m ambitious and decisive and very good at making things happen. Yesterday, I had a tow hitch installed my Subaru and this weekend I’ll be taking off to Nebraska and Colorado to check out a couple of Teardrops! This time next week, I just might be bringing one home! Stay tuned! This entry was posted in Photography, Road tripping!, Sustainable Living, Vagabonding 101 and tagged Teardrop trailer. Bookmark the permalink. 24 Responses to Teardrop Dreams… Coming True! This is wonderful, when you posted this picture a few days ago I thought, what a great little home! I hope you can get one and I’ll look forward to seeing pictures of it traveling all over- I wonder what the dogs will think of it? Good for you! I’ve always loved these little trailers. Looking forward to hearing more of your adventures. That’s awesome! I considered buying Apple years ago, but didn’t do it for whatever reason. Sure am regretting it now. We bought the camper Egon built before yours, and I hope you look at his before you look at the other one…his design is clever, practical, and homey. Actually, his use of space is genius. His craftsmanship is master level or higher. You won’t even need to look at the other one. Our main concern was clearance and in one week Egon added another 2″ clearance for us. Yours is on 1″ bigger tires I think and so already a bit higher. We previously had a 4′ wide teardrop without ventilation and the door leaked in the rain — we’d rather tent camp than suffer (suffocate) through that again. There are probably other good teardrops out there, but Egon’s are the pinnacle. I’d love to see his design go mainstream, but I don’t know if Egon wants that or not. We haven’t taken Egon’s camper camping yet — we bought it in late Fall, but we have slept overnight in it and towed it in the rain. As for your website, blog and photography….very interesting. I’m surprised you don’t mention more or go to more back country Anasazi sites in SE Utah / SW Colorado. Of course we are a bit biased and go to these places twice a year on our vacations. And after seeing your panoramics, now I want a Sony Nex even more. I don’t have the patience for stitching photos together. Good luck on your hunt for a traveling home, and on your ongoing travels! Hi Vicki! Thanks so much for dropping a line! I can’t wait to see Egon’s creation in person! It looks and sounds amazing. I’m definitely planning to head straight to Nebraska first. My main concern is the weight and size. I have a Subaru and I don’t want to tax it too much. Do you know what yours weighs? Are you happy with its maneuverability? Egon’s camper maneuvers great – surprisinly smooth ride. We barely know we are pulling it. I accidently drove over a curb corner and the camper barely tipped. I weighed ours on an ag coop scale and it said 620lbs (not loaded). We have a 4 cylinder Chevy Tracker which doesn’t have a lot of power, and the camper does slow us down a little when driving into the wind (for example, going into the wind we might only go 62mph instead of 65mph) or uphill (the Tracker crawls when going up mountains anyway). Motor RPM doesn’t seem to increase. I think Egon says he pulls his camper with a Toyota Camry. So I doubt your Subaru would have problems pulling it, or at most, might slow you down a little. We can easily see around both sides of it with our side mirrors. Our favorite backcounry Anasazi sites is the Cedar Mesa area. In particular we are in love with sites along Comb Ridge. This book is an excellent resource http://www.amazon.com/Hiking-Guide-Cedar-Mesa/dp/0874806801 . Lots of people seem especially in love with the Grand Gulch, but we were disappointed Tamarisks seem to be overtaking it. We plan to do Slickhorn this spring. It’s supposed to have a lot of amazing and fairly pristine sites. I love the looks of this- I might have to take back everything bad I’ve said about trailers (as a biker frequently thrown by them on the road!) This thing has proper style! Happy hunting and home-making! On your way through, I suggest the Redwoods, the BC coastal rainforest, the Yukon of course, see my friends and new trophy holders of the Ididarod, the Seavey Family in ALaska, then pop back down through the Canadian Rockies (if you’ve not been they will blow your mind no matter what you’ve seen before) Jasper and Lake Mariene are my favorites! Then pop down through Whitefish Montana, If it’s late enough in the year, I should be moved in by then and I’ll make you a fantabulous coffee, then you can check out the Montanan Vortex, then, then if you’re really super special, I will tell you the best trail in all the world to a natural spring that gushes mountain nectar through a cave down to a Cascading waterfall. And then well, you better hit Red lodge and have the best Pizza you can imagine, and then well I don’t care 😉 Have a blast Chica! Believe it or not, I have been to the Montana Vortex! What a trip! Everything on your to see list sounds amazing. I’m thinking about heading up through the Rockies in July and back down along the coast in September. Thanks for the suggestions! I might take you up on that coffee one of these days! This was a list I had made to take my sons on. 🙂 Have a great time regardless, and if your journeys take you near Edmonton, or Whitefish, you’re coffee and dare I say coffee-cake, will be ready and waiting 😉 God Bless and Have Fun!